Your hammer drill still not small enough for you? 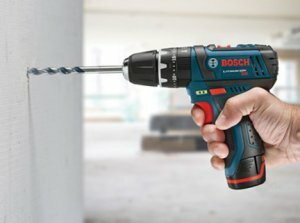 Bosch just announced that they are coming out with the PS130 hammer drill for their 12V Max line. I don't know exactly who a 12V Max hammer drill is aimed towards, but with the popularity of ultra compact tools, I guess it makes sense. What kind of holes could you drill with a 12V Max hammer drill? I assumed that the holes you could drill into concrete with the PS130 would have to be pretty small, but I was happy to find it can drill up to 3/8-inch holes. At only 7.3 inches long, 7.1 inches tall and weighing only 2.3 lbs, I could see the PS130 being used by contractors that only occasionally have to anchor into concrete. The drill still has all the features we would expect from a full sized dill, like 20 clutch settings, the ability to turn off the hammer action, an LED light, electric cell protection, and a two speed transmission. The PS130 even has a built in battery gauge. The drill will be available as a kit (PS130-2A) that includes two batteries, a 30-min charger, and carrying bag. It is expected to retail for $159. The bare tool option (PS130B) should retail for $109. Look for them in stores soon.